Brookfield Multiplex has completed Salvo Property Group’s $55 million Bella Apartments at 248-252 City Road in Melbourne's Southbank. The 33 level tower comprises a total of 228 apartments in one and two bedroom configurations, including a gym and ground level retail tenancies. There are also three levels of car parking that contain a car lift and bike storage. 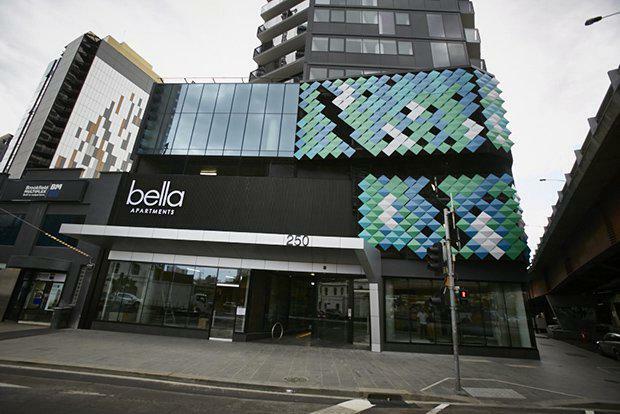 "We are delighted to deliver the completion of Bella four months ahead of schedule. Throughout the construction our team had to overcome many challenges associated with constructing a large-scale project within the busy CBD environment," said Mr Graham Cottam, Regional Managing Director Victoria at Brookfield Multiplex. Some 200 people worked on-site during the construction of Bella Apartments. Key construction challenges included Bella’s close proximity to the busy Kingsway overpass and associated tight constraints for construction site logistics. The relatively small site floor plan also meant limited storage space with tight delivery schedules maintained in order to reduce potential delays. Bella Apartments features a number of ESD features including water efficient fixtures and appliances and energy efficient glazing which was used throughout. Brookfield Multiplex has completed a number of residential projects over the past two years including The Quays $180 million tower on the corner of Docklands and the Harbour Esplanade, Stage Two of the Upper West Side Apartments valued at $150 million and the $300 million Prima Tower in Queensbridge Street, Southbank. It has over $800 million worth of projects underway in Melbourne with residential towers including Platinum Tower in Southbank along with Australis, Melbourne One and Southbank Grand and the final stages of Upper West Side.